See how we make it easier. Why take risks with your business? Standardizing processes and integrating them into day to day workflow will create a safer workplace and help you avoid fines and penalties by staying in compliance with required standards and regulations. Additionally, Way We Do’s reporting systems make it easy to provide evidence of compliance by producing records of how team members follow policies and procedures. Franchisors have easy access to their entire franchise network’s Way We Do accounts through their master account. 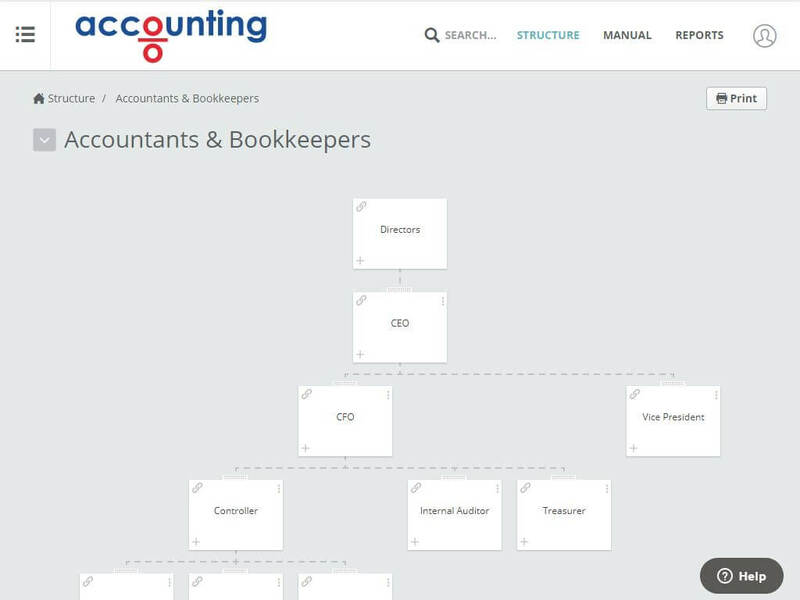 The master account allows franchisors to install, update, and manage approved templates, policies, procedures and checklists across all franchisee sub-accounts. It also allows the franchisor to monitor the use of the franchise manual, and view and print usage reports. 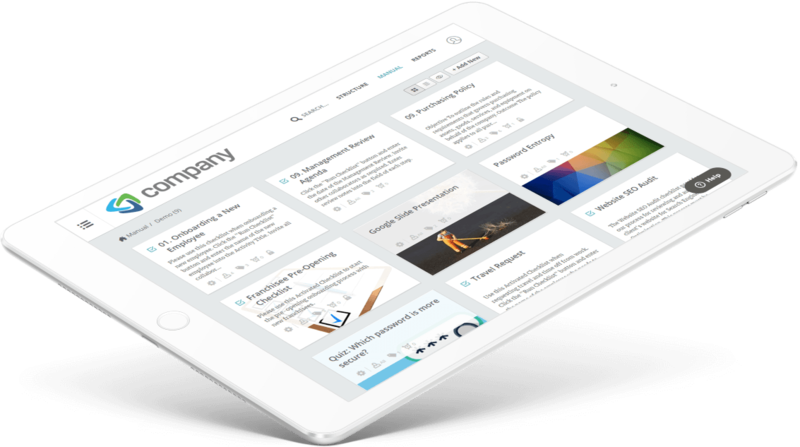 Way We Do helps business owners to easily document processes, procedures and workflows so that knowledge is retained within the business itself, and not just in the minds of the people who work there. This systemization protects the company IP even through staff changes or sale of the business. In fact, you can increase the value of a business by 2 to 3 times when you systemize your business and document the way you do things since by showing buyers these preparations you reduce the risks and fears they may have. On average, business inefficiency can cost up to 20% to 30% of a business’ revenue. In order to grow a business, companies must create repeatable processes that ensure consistent quality and smooth delivery of products and services to customers. Way We Do provides practical tools that enable team members to use procedures in their daily workflow, which increases efficiency, lowers costs, and increases customer and employee satisfaction. What do you want your customers to say about your business? By monitoring your systemized processes, you can ensure that your brand is recognized for delivering consistent service and high quality products. The majority of policies and procedures are documented using Microsoft Word and other Microsoft software products. The resulting Operations Manuals, Training Manuals, and other documents are located on the server or buried within a software application. While Microsoft provides excellent software products, 44% of employees state they access few or no SOPs because they were not easy to find, they were not up to date, or procedures were not documented*. Source: TNS Global, Current State and Importance of Business Process Management (BPM), 2016. Additionally, these documents are static. They do not actively prompt team members to follow the procedures that they are responsible for, nor do they gather data around the usage of the documents. Business process flowcharts and BPM suites typically focus upon process, and Knowledge Management systems focus upon knowledge. When using these systems, the two are separated, and therefore knowledge and work instructions are not provided at the same time while the team member is performing a task or process. The information is out of context, and this leads to issues like frequent inaccurate or incomplete tasks. Today, businesses have to not only provide policies and procedures that are mission critical to their operations, but they also have to prove that they are being understood and used. If policies and procedures are not being followed, it can lead to dire consequences for the organization, such as brand reputation issues, poor business performance, harm to employees and customers, fines and penalties, and even business failure. Way We Do solves both problems by turning static documents into a living, breathing tool, that actively prompts team members to do tasks they are responsible for based upon their role. Our system presents the policy, procedure or checklist for team members to use at the moment it is needed. This kind of triggered interaction brings process and knowledge together in context so that tasks are completed accurately, consistently, and in keeping with safety regulations and requirements. In addition to helping team members complete their tasks, Way We Do provides visibility to management so that they can monitor what work is being done, and who it is being done by. 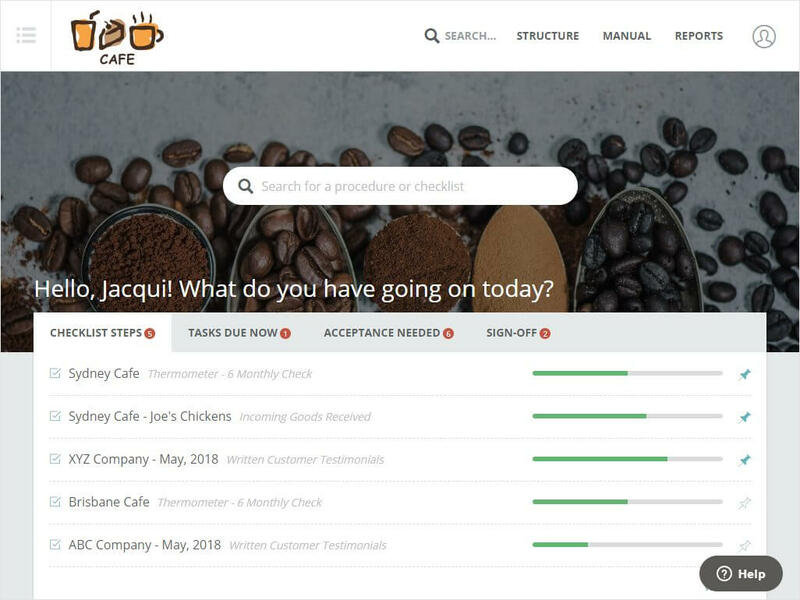 Built in acceptance criteria and tracking provides clear records of work tasks and results, as well as automatic documented compliance for regulatory agencies. Create Activated Checklists for all your repeatable processes so that team members always remember what they are supposed to do. Add procedures to each step in the checklist to make instructions instantly available and integrate your SOPs seamlessly into daily workflow. Designate tasks and checklist steps to specific team members, and send links to procedures and Activated Checklists steps automatically when each task needs to be completed. Only people assigned to roles will be able to complete tasks and check off steps with their role specified. The Way We Do Dashboard makes it easy for users to monitor their daily tasks and access procedures they are responsible for completing. Team members always know what procedures they should complete; Editors know which policies and procedures are due for revision; and Managers are notified when it is time to review and sign off on completed work.